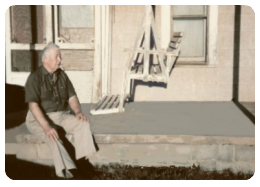 In the late 1980s a family heirloom was revived, when Charles's Sister Abbie Cotrell ask him to fix up an old Treadle swing for her porch, that was built in 1910 by Charles's Grandfather, Albert Massey. The swing was not in good enough condition to restore, so Charles built a new swing, using the old swing as a pattern. 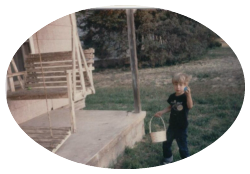 He built two swings, one for Abbie and one for Margaret Leeds, his Sisters who both live in San Antonio, TX. 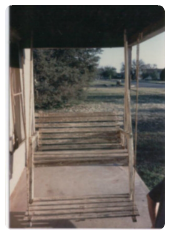 The original swing is now at Charles's home.in Cedar Park,TX. Charles has taken that design and updated it for the modern home. 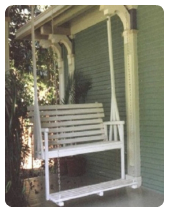 Updates include a stylish arbor which allows the swing to be mover into the garden, patio, yard or under any great oak, a breaking system for getting safely on and off the treadle swing and cup holders in the arms. At left is Alvin Massey, Charles's Dad and Son of Ablert Massey, at his childhod home in Memphis, Texas 1985.